Cloud Climbing Beauty: Best Buys of the Campaign 19 Brochure. We're gearing up for Fall! Best Buys of the Campaign 19 Brochure. We're gearing up for Fall! I hope all of you are well. I've been spending a bit of time at Crestwood Hospital lately with my parents, because my mama is dealing with heart arrhythmia issues. She had a catheter ablation yesterday and will have a pacemaker installed tomorrow, so I plan to be up there again soon. We are hoping that after this surgery she will be feeling much better and life can get back to normal for her. She is turning 83 in October, and my daddy turns 89 in December, and they have been in pretty good health most of their lives, but age catches up to us all if we live long enough. So, I missed getting my Terrific Tuesday post out yesterday but I hope to be back on schedule with a great new product next Tuesday! Pg. 17, The Fall color report is that greys will be popular for eye makeup, and we have plenty of them in our eyeshadows, including Eye Dimensions Eyeshadow in Sultry Smoke, specially priced at $4.99. Pg. 19, For nails this fall, greens and turquoise will be popular, and we have them in three different nail enamel types. Speed Dry+ is $3.49, Nailwear Pro+ is $3.49, and Gel Finish 7-in-1 is $4.99 this campaign. Pg. 21, Plums for lips will be a perfect match to the greys for eyes, and we have Ultra Color Absolute Lipstick in Radiant Raisin as well as 8 other shades at Lowest Price Ever of $59.99. I see that this lipstick is marked "while supplies last" which means we are discontinuing it, so get it while you can if this formula is your favorite! If you prefer Beyond Color Lipstick, we have Berry Cute and Divine Wine along with 13 other shades available for $4.99 each. Pg. 27, SuperShock Mascara is $4.99 and Be Blushed Cheek Color is LPE of $4.99. I might need to get some Mandarin Glow myself, as it's my favorite! Pg. 31, Anew Age-Transforming Foundation is LPE of $10. Pg. 32/33, Any 2 Mascaras for $7.99. Getting these mascaras (including the Big & ... ones) for $4 each is a WOW deal!! Pg. 42/43, All Makeup Brushes are on sale. Pg. 47, Moisture Effective Eye Makeup Remover Lotion is $1.99. This product is great for removing eye makeup gently. Pg. 52, Mesmerize Black for the man in your life is only $12.99 - Best Offer Ever. There is a scent spot on the page. Pg. 69, The Secrets to Keep line of fragrances - Original, Kiss, Midnight - are only $8.99 each. Pgs. 70-77, Almost all of our Clinical products are included in the Get any 2 for $35 offer on these pages, making them $17.50 each, a bargain you don't want to miss! Pg. 87, Avon Solutions basics - Nurtura, Banishing Cream, Dramatic Firming Cream - are any 3 for $9.99 each. I have a customer in her mid 90s who is using the firming cream on more parts of her body than her face now and was wondering if it came in a larger size. I'll have to tell her about this offer, which is great for her fixed budget. Pg. 171, Now in season, Fresh Orchard Apple in our Senses line, 4 products for $10.99 - 2 Shower Gels, 1 Body Lotion, 1 Bubble Bath. Back Cover, Full-Size Hand Creams are $1.99 each, with 8 different options available. That's about enough. I don't like to get these lists too long, but I know I sometimes do. :) Have a wonderful rest of the week! Avon On-Boarding - Rise Up! 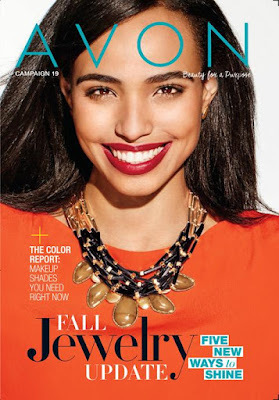 A Change is Coming to Avon On-Boarding! Terrific Tuesday - A Free Shipping Offer! C18 Brochure - Now Live on my eStore! What a Deal on Avon Eye Care & Makeup Products!